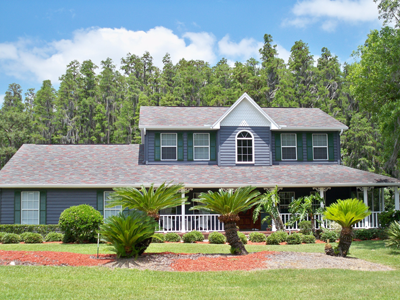 Tampa Asphalt Roofing Shingles Installation | Tampa Roofing Company Inc.
Tampa Roofing Company is an approved applicator for most major manufacturers and has many different styles and life expectancies to choose from. Generally speaking, if you have seen it, we can install it. At Tampa Roofing Company we never ask for a down payment on contract jobs. We want to make sure that you are happy with the work before we ask you to pay the bill. If you purchase an extremely expensive roof we may have to ask for weekly draws, but most residential roofs can be completed in less than a week. Our procedure is to ask the home owner to walk around the house, and inspect the roof and the premises. Once they are completely satisfied with the work they pay the bill. The replacement of the roof on your home is one of the largest investments you will make to protect your belongings in most peoples’ lifetime. This process can be a miserable experience, but we will do everything in our power to make the inconvenience as painless and as positive an experience as possible. The following are some, but not all of the procedures we follow to make sure that happens. At Tampa Roofing Company we own all of our own equipment and will use our own trucks and trailers to remove all of the debris from your roof. All trash will be removed from the premises daily, and the equipment will be removed daily to give you full access every night. We will try to give you the feeling that we have never been there. It will be necessary to install a dry-in felt over night, but all debris and large equipment will be removed daily. Tampa Roofing will never rent a dumpster, and park it in front of your garage for a couple of days during the installation of your roof. This eliminates scuffs and scrapes on your drives or sidewalks frequently caused by dumpsters. At Tampa Roofing Company we understand that when your roof is replaced, you have to place your trust in us to provide you with the best roof replacement possible. While it is important that we do not cover any deteriorated or unsecured decking, it is not always possible for you to be there and personally see the work that is done. It is also important to know that we are not charging you for work that was not done. Our crew leaders take digital pictures before and after so you can verify any and all work that was done. The most common shingle underlayment that has been used in North America for the last 100 years is 15 to 30-pound asphalt felt. These products have performed well when properly secured according to current State of Florida codes. I do not like using asphalt underlayment for two reasons. One, even though there are 100s of holes through them when you nail the shingles on them, it is still a very large sheet with a high tensile strength. This allows them to perform as a kite and will have an abnormal amount of uplift on shingles in heavy wind storms. While that is a possible problem, asphalt shingles perform best when they are sealed with asphalt or oil-based adhesives. We have found that the use of oil-based sealers with synthetic products tends to break down the synthetic and for that reason we would prefer oil-based underlayment. Insurance companies will also still give insurance discounts when Ice and Water shield “peel and stick” underlayment’s are used. Two of the problems we’re now seeing with the Ice and Water shield is we’re aware Ice and Water shield would stick to the deck and make it difficult if you must replace a sheet of plywood. We have now found that the Ice and Water shield will also bond to the shingles making it almost impossible to remove the shingles. We are currently installing a roof for the Vice President and we are installing Ice and Water shield directly to the deck for the insurance rebate. However, we are also installing a 30-pound asphalt felt over the Ice and Water shield so that when the time comes to re-roof to tear off the shingles, we may not be able to tear off the 30-pound felt if it has fused to the Ice and Water shield. But we can still have a smooth surface if by being able to remove the shingles. In Miami, you’re required to install 30-pound felt if you want an Ice and Water shield. It must be installed over 30-pound felt so that when the roof is replaced, you have an ability to inspect the deck. Unfortunately, the insurance company require that the Ice and Water shield is installed directly to the deck to get the insurance discount. So, no one in the Miami-Dade high velocity wind area can receive the insurance discount for the secondary water proofing. Hopefully one day the insurance companies will get their act together, but at this time, it doesn’t look like it. If you check our founders, you see our Vice President currently sits on Florida Building Commission. It has been brought to their attention that there is a serous problem with the current fasteners used to install asphalt shingles. When Morris Swope wrote the original code, he required the use of hot dip galvanized nails as a minimum fastener. He always rejected the use of electro-galvanized and coated nails. So for 20 years, operating under the Southern Standard Building code, he was able to stop it. A few years back, State of Florida adopted the International Building code which allows pretty much every fastener known to man as along as it meets basic code requirements. Unfortunately, the Chinese have put most of the U.S. manufacturer’s out of business and now we are facing a Chinese fastener problem equal to or worse than the Chinese drywall issue. Our studies have shown that after the nails have been hammered into the roof the coatings break down the fasteners decompose, and the heads pop off. Which is great if you purchase an extended warranty shingle and the manufacturer will still warranty the shingles that are laying in your yard to be in good shape but not water tight. Tampa Roofing Company has a complete sheet metal shop with computerized break and shear equipment. This allows us to make a factory detail for the special areas of your house instead of purchasing a pre-made flashing which must be trimmed and formed in order to fit your house. We have the ability to form standing seam or flat metal valleys for your house. However, we have found that most people like closed weave or half woven valleys. We do not advise burying a galvanized metal valley under the shingles. We have seen many instances where the galvanized valleys will rust in 10 to 12 years. We have been installing a commercial roofing product called modified bitumen under the closed valleys. We have been using this application since 1985, and have yet to have a leak from this application. When you purchase an extended warranty, there are 2 basic types. One is a 50 year “lifetime” warranty that covers 100% of the cost to replace a roof for the first 20 years. Most of the heavy-duty shingles will last 18-19 years and if need be, the manufacturer can push them for 20 years. At 20 years and 1 day that warranty changes form a lifetime labor and material warranty to a depreciated material warranty. We have found through my grandfather, my father and my own experience the cost of shingle roofs double usually every 12 years. So, if you purchase a roof today, and the manufacturer’s deprecating material warranty only covers the shingles not the felt, nails, flashings, tear off, etc. The cost of the shingles is historically 25% of the cost of the roof. And if your roof goes 20 years that’s 40% of the 50-year lifetime warranty. So, if the manufacturer gives you 60% of the 25%, that’s 15% of the original cost of the roof. For example, if you buy a 10k roof today and you purchase this 50-year lifetime warranty, 20 years from now, they will pay you $1500 to replace it. Unfortunately, the 10k roof today, will cost you approximately 20k in 12 years and 30k in 18 years. So, with this warranty, you get 1500 to replace your 30k roof in 20 years. We have been able to work with Tamko on an exclusive partner basis that allows us to offer a 30-year labor and material warranty that does not depreciate at all. If your roof goes bad within the 30-year period, I understand they cover the whole cost of labor and material, 100%. I guess it’s possible for them to have a shingle last 30 years somewhere in the U.S., but I’ve never seen one last longer than 21 years in Florida. It’s 100% transferable within the first 10 years, this is the best warranty going and we suggest it on every roof. License # CCC0324 - © 2015 Tampa Roofing Company, Inc.